Its already November now and we do remember Samsung’s new series of smartphones, one of them will be SM-Z130H, to be launched in India this month. Apart from its cheap price and 4-inch screen size, we barely got some other details of this device. Today, on User Agent Profile page of Samsung, we got some minor details of this upcoming device. 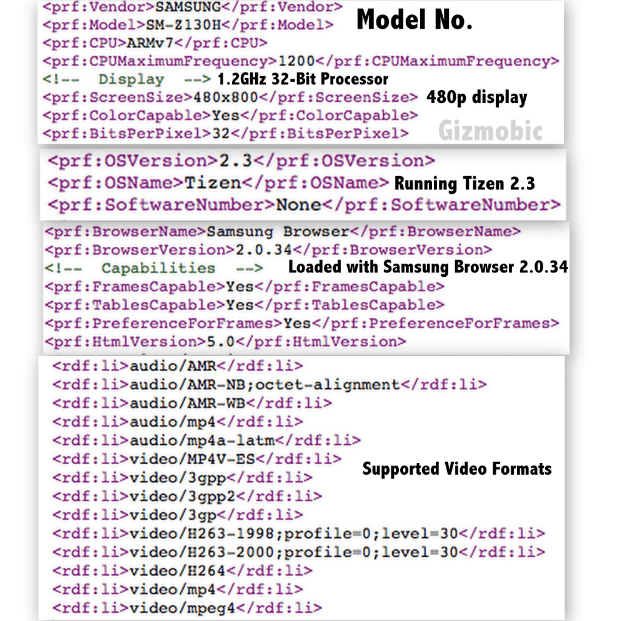 These specs were written in simple, XML type format on source page. In order to make it a “real budget-friendly” device, Samsung has loaded 32-Bit (ARMv7) 1.2GHz processor along with a 4-inch 480p display in this device. On software side, Samsung SM-Z130H comes loaded with OS Tizen 2.3 out of the box. This new smartphone will support various type of video formats, starting with 3GP. Additionally, Samsung is all set to load its new Samsung Bowser 2.0.34 in this low-end Tizen smartphone. We were not able to spot its RAM part but one expect it be 512MB(if priced below Rs 5000 in India). One can expect this device to arrive before the 3rd week of this month. This new smartphone is also rumoured to get 3.2MP camera on its back.